Posted on April 16, 2012 by Melanie B. This book was recommended to me by several people who loved it. I agree – this was an interesting book to read. When I was not reading it… I was thinking about it. To me, that makes for a great book. If I can put the book down and completely forget about it-it may take me a while to pick it back up again. “State of Wonder” takes the reader out of their element and into the Amazon Rainforest to a very remote lab where several doctors are attempting to create a drug for a large pharmaceutical company. This book has interesting characters, great environmental descriptions and makes the reader think about the choices the characters faced with. 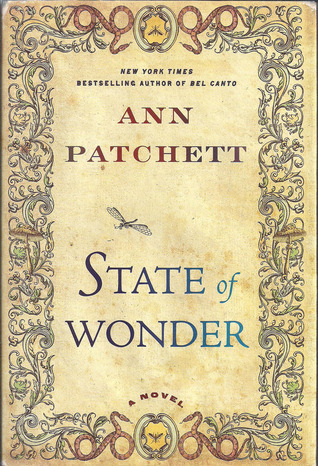 If you’ve read “State of Wonder,” I’d love to hear your comments. If not, this is a great book to add to your “to read” list! Award-winning “New York Times”-bestselling author Ann Patchett (Bel Canto, The Magician’s Assistant) returns with a provocative novel of morality and miracles, science and sacrifice set in the Amazon rainforest–a gripping adventure story and a profound look at the difficult choices we make in the name of discovery and love. Side Note: I have also read “Bel Canto” by the same author and it remains one of my favorite books. Please check out the “reading now…” section of my blog for my current book.